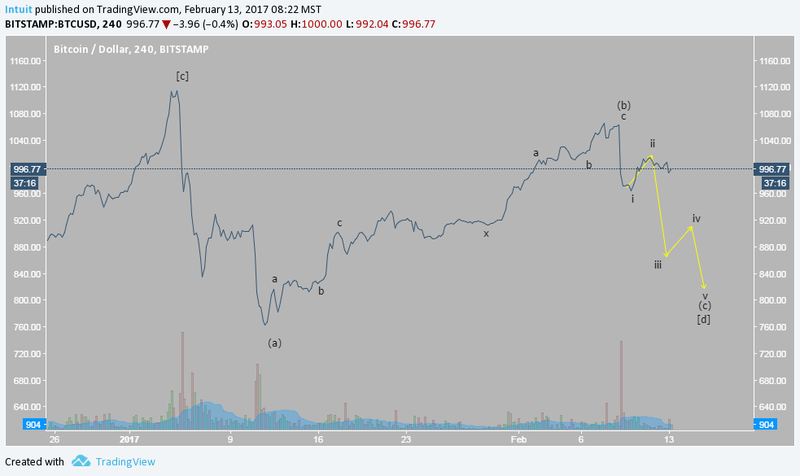 Bitcoin is at a yuge Harmonic and Elliott Wave reversal zone. If this breaks up about 100 more dollars and can stay above that resistance zone , then it will become a support zone and the trend will likely continue up from there, possibly to 1500 usd. If the bears can hold this resistance zone then Bitcoin will likely continue the megaphone pattern that it is in ( aka the expanding running triangle) and we will likely test the bottom of the megaphone around 600 usd before making our way to about 1500 usd. Right now the trend is still fairly strong up, so it is likely to continue, but this potential reversal zone should not be ignored, because it will either confirm or deny the continuation. The fact that we are stalling here, and the fact the momentum seems to be slowing down on the 4hr, could be a sign that we are about to drop . BUT if there is a clear break out of the harmonic PRZ then we will definitely went to get long and continue to ride out the rest of this trend. Harmonic's are signals that work in BOTH directions. A failed bearish harmonic can actually be a very powerful continuation signal IF the original reversal zone fails and becomes support. The Elliott Wave can also give continuation signals which is one way I was able to reverse my last two bearish charts for a large profit multiple times over the last few months and call the continuation of the bull run. I admit, it went much farther than originally forecasted but strict adherence to a smart risk management strategy kept us in the great majority of the trend and free from any major set backs. The failure of many sell signals all at the same time immediately preceded the massive rise over the last 2 weeks, and acted as a great signal to buy on. The Bubble in June (wave (a)) on a lower timeframe), despite it's strength, is actually only a double zigzag and not an impulsive wave. Double zigzag's frequently emulate impulsive action because they are made up of 4 impulse waves, and since the structure is corrective in nature, and because it is followed by two more corrections (waves (b) and (c)), that means we are very likely in an expanding triangle. That would make sense because expanding triangles tend to be the most treacherous trading environments and can be very difficult to predict until they are completed. This count is also fairly unconfirmed, so it could definitely change in the future, but for now it is my best interpretation. If the harmonic PRZ were to fail then the count would most likely need to be altered because whatever I am assuming it to be now would likely be invalidated in such a bullish situation. For now, this is definitely a key level to be watching, perhaps one of the most critical™ in all of Bitcoin's history. 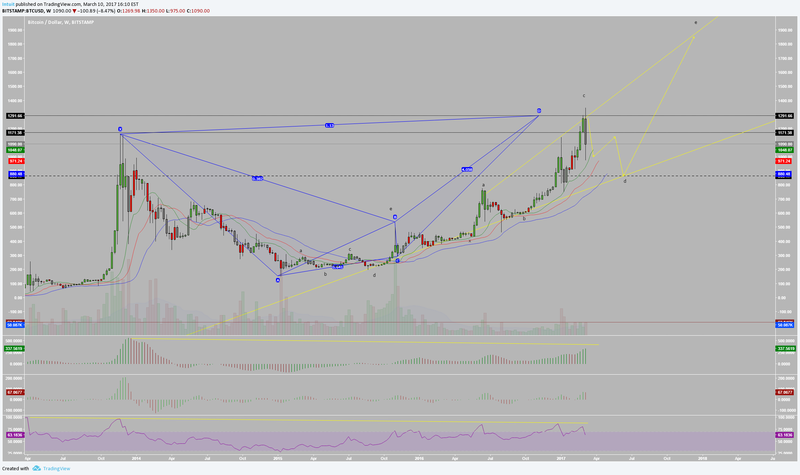 This also coincides with the largest Harmonic PRZ on ETHBTC ever as well, which has surprisingly held up very well over the last 2 weeks even with Bitcoin experiencing a massive rise, perhaps lots of strong hands buying at these low prices on ETH? If these PRZs hold then we could begin to see an altcoin boom while BTC begins to stall for a few months, if they fail then of course the opposite will happen and ETH could drop down to 4.5 USD while BTC soars up to 1500. Life is about the journey, not the destination. Focusing only on win/loss ratio is polar thinking that is destructive to profits and enjoyment of life. With the right strategy the only thing that you need to focus on is the process and then the content will work itself out. Focusing on content leads to expectation, upset, and loss and causes you to focus on the past or future which brings about feelings of guilt, shame, and sadness or feelings of doubt, fear and anxiety. Focusing on process allows you to stay present in the here and now so you can simply notice, be at choice, play with options, and flow towards your goals easily and with little stress. According to this article, China has just begun considering devaluing the yuan and imposing capital controls on Bitcoin around the same time that I posted this chart originally. Interesting how well they line up with each other, so what do I think this means? Well usually when a country devalues their currency they do it because they want people to invest in their domestic economy, so if China does decide to devalue the yuan they are doing it for the sake of getting people to invest in Chinese stocks, et al. NOT into things like bitcoin or foreign stocks that do not help build the Chinese economy. So with that said, its fairly obvious that bitcoin is used to get money OUT of china and around their capital controls, especially because their economy is in a massive recession right now and has been for a long time. So, there is a chance that the Chinese government may decide to ban or regulate Bitcoin to prevent capital flights ahead of a currency devaluation and force people to invest their devaluing yuan into the Chinese economy instead of into foreign assets. China has a history of being anti-bitcoin and of imposing very strict capital controls, so such an event would not surprise me at all. HOWEVER, there is the possibility that they DON'T impose capital controls and then we could see bitcoin's value increase massively because many Chinese investors will be dumping their devaluing yuan into Bitcoin. However this story turns out may very well determine which direction this chart ends up playing out in. Because the play button isn't going to update for a few more days when the weekly closes I'm going to post an update right now. The big wick above to PRZ does not invalidate the PRZ because it is only a wick, regardless of how big it is, and relatively its not really even that big on the weekly and is definitely within the limit considering that its only a wick and now the last price is well under the potential reversal zone. With that said, so long as we don't fully retrace this down move and break above the high we've currently set in place, It is definitely very likely that this is the top and from here we will go and test the bottom of the megaphone around 600 USD. If we did break above the high it would be a good idea to get long. For now though It's a good idea to find place to short on the short time frames charts. I'm not posting this chart now because I'm saying to short right this second, but It does look like after some correction we will continue the downtrend, so long as this correction does not retrace the down move too far. It seems the sell-off was partly due to china tightening up their capital outflows and also encouraging state owned enterprises to sell foreign currency reserves. A rebounding currency would alleviate pressure on Chinese authorities battling to curtail capital outflows after an annual $50,000 quota for citizens to buy foreign exchange reset on Jan. 1 and the imminent inauguration of U.S. President-elect Donald Trump lifts the dollar." Because bitcoin moves inversely to the yuan, the bullish momentum on CNY could keep BTC trending down for a few weeks like charted. Also with China becoming more and more aggressive with their control of capital outflows we are very likely to see them begin to strictly regulate exchanges and try to prevent Bitcoins from leaving China and going to other countries like the US, in an effort to prop up the yuan and their economy. Such an event will likely coincide with a major decline in price that will probably be larger than the decline we just had. Bitcoin appears to be in a Bullish non-limiting triangle on the short-term charts which will likely conclude a triple combination that is wave a of (d). However, It's possible that this triangle breaks down and we immediately make a shot for 4400 CNY, its much more likely that this gets some retracement from here and we form a wave similar in structure to Wave (b). This would mean that we should get a big correction that may last several months and retrace as high as 7800 CNY, before continuing the downtrend. Eventually some major event will probably happen, like China tightening up their Bitcoin regulations, which will cause a major panic in price and which could quickly take us down to 4400 CNY, before recovering to ATH. Comment: Seems like the triangle broke down, there could be more downside in store after some correction here if resistance holds up. 4400 CNY still seems like a decent target for now after the correction. This is my current short-term count. Not sure if this is going to be all of wave d or just wave a of d (on the daily timeframe), so we'll have to see how it plays out. Since I can't be sure I'm going to go with the assumption that it is wave-a of d because that seems more likely. Also since it appears to be a double combination wave-a, when it is finally complete, it will probably retrace about 80% which would take us almost back to ATH, before falling back down to 4400 CNY again. IF this count plays out we could stay in this massive range for a few months before finally continuing the bull-run. This count is still extremely speculative though so it will likely be changed with new information. Comment: As I said 1 month ago: "with China becoming more and more aggressive with their control of capital outflows we are very likely to see them begin to strictly regulate exchanges and try to prevent Bitcoins from leaving China and going to other countries like the US, in an effort to prop up the yuan and their economy. Such an event will likely coincide with a major decline in price" It seems china is again tightening controls on Bitcoin exchanges in an effort to prevent capital outflows, which has begun with a halt of all withdraws. The next big move may be china imposing a quota on bitcoin's aloud to leave the exchanges. It also seems like we could now be starting wave-c, we'll have to see how it develops to determine if it is an impulsive or corrective wave-c, either way we will likely see a major advance after it is completed. Since this is part of an expanding triangle, it is possible that wave-c of (d) will be extended and could take us all the way down to 620 from here. It will be difficult to know until we are closer to the end how big this wave will be, but it does seem very likely that this is the beginning of wave-c and we could go anywhere from 850 to 620 USD from here. Triangles are generally the trickiest patterns to trade so it's advisable to be very cautious here. My target from the other day ended up being a direct hit. Looks like we could be completing wave ii or, at the least, we are completing wave a of ii, which may be the more likely due to the structure. So this could still range here for a little while before wave iii begins but for now it looks like we've made a nice high price for wave ii. Comment: Due the to amount that we have retraced what I previously had labeled as wave i, we are most likely NOT in an impulsive wave-c. Either we are still in part of wave-b OR we are in a corrective wave-c and this is wave-b of c. Eventually, we should break down from here, it's just a matter of when. As I had predicted earlier we did actually stay in this range on BTCCNY, but on BTCUSD it seems we had a slow climb up to new local highs, though this doesn't invalidate the longer term count the short term count does need to be modified some what. This count is still very unconfirmed, and we will have to wait until there is a break down before we can be sure that this is going to continue down from here. If we do continue up significantly from here it is possible that this could keep going up. Below 1065 is bearish, but due to the momentum it seems possible that we are actually going to break the 1065-1075 resistance zone, and above that range it will be a good idea to open more longs because this could go all the way to the next harmonic resistance at 1175 and potentially much higher. But, If this resistance holds then we could get a very deep retracement down to 800-600 USD, so its a good idea to keep an eye on this resistance and watch how price reacts here. We are now breaking up from the harmonic resistance zone like predicted, the momentum here is very strong so this resistance should now become support and we will likely see significantly higher prices from here. The next harmonic resistance zone is at 1175, we'll see if that one can hold or not, I honestly wouldn't be surprised if we did break through that and headed towards 1500, but we'll have to wait until we get to that point to see if it is going to hold or not. It's also possible that we stop before that point so it's a good idea to be trailing a stop loss, especially because the PBOC could announce new rules at any time while the exchanges are still in limbo with withdraws disabled. The bullish reversal is playing out perfectly so far, BTCe just made a new ATH and Stamp just broke over the high set at the beginning of the year, both of which are huge long-term bullish continuation signals. I'm still expecting there to be a panic when new rules come out of China, so I'm always moving my stop loss up and looking for places to hedge, but I wouldn't be surprised if this continued up after the initial panic. There are quite a few resistance zones between 1175-1780 on stamp, so we'll have to take each one as they come. If we do break through the final resistance at 1780 we could see some extremely bullish price action, but lets not get ahead of ourselves, there could easily be a significant retracement before we break each resistance, which means that it will likely be a bumpy ride all the way up to 1780. We are currently stuck under a critical resistance point, and now the biggest harmonic that bitcoin has ever been in. This time it is an alternate bat with a very nice RSI BAMM confirmation. It's still not fully confirmed yet until the RSI goes back under 70, but we could have already reached the highest price point if this resistance holds. If we do break 1300 then it is possible we will go to the next resistance above 1375 and possibly higher. If we break 1231 then its possible that this could fall significantly lower. Hard to say how low exactly it will go but it could go as low as 800s. We may stay stuck in this range for the next couple of days while we await the decision from the SEC on the ETF and from the PBOC regarding withdraws from the major bitcoin exchanges. If the news is all around positive this could definitely break up, but if the news is negative then it is likely we'll get a very deep retracement. Looks like we're bouncing off of my lower target, the ETF got rejected and this was likely the first wave of panic. It is possible that we get a 2nd wave after some correction, or that we just continue back up from here, we'll have to see how this develops to know for sure. The harmonic resistance turned support around 1000 held perfectly, and now we just have to break the next major resistance above 1300 to continue the bull run. Another drop is definitely possible but it seems there is a hard support around 1000 USD that most likely will not get broken any time soon. I have no idea what to make of this chart. First off you have a weekly chart in Arithmetic instead Linear which is a glaring mistake of epic proportions and if that wasn't bad enough you've selected points to curve fit as close to a .618 as you could so bad that you put point B in the middle of the wick just to make a .618 and point C doesn't get any more curve fitting then that. @Intuit, No trader using harmonics selects points in the middle of wicks your curve fitting and this chart is bunk as you drew a bearish harmonic which failed because it's nothing more than pseudo garbage. @BTCMarket, Lmao, thanks for your input. @BTCMarket, In this market, a lot of the moves are exaggerated due to the fact the trading engines fail and stop working. Otherwise professional traders would be absorbing supply at stupidly oversold levels. @JesseGreen, Actually you're wrong there, Bitcoin sees large swings either side due to a lack of liquidity. Bitcoin exchanges in general have very low liquidity. If you wanted to purchase 500k or even 1 million USD in Bitcoin how much slippage do you think you would have to put up with before a fill? When Bitcoin begins to move and traders market buy or sell there simply isn't enough liquidity either side of the book to absorb those orders so price moves very deeply until it finds the liquidity to fill those orders nothing more nothing less. looks good. keep up the updates! Exactly my train of thought as well, thanks.